The previous example showed how to use Web Parts within a page and how to switch the page between various modes at runtime. 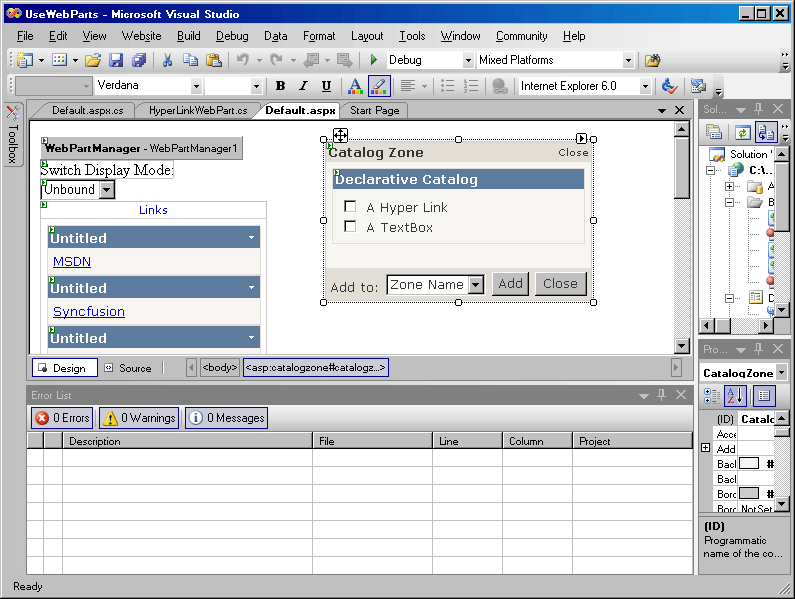 The catalog built into the page includes a TextBox control that you may add to a WebPartZone on the page. 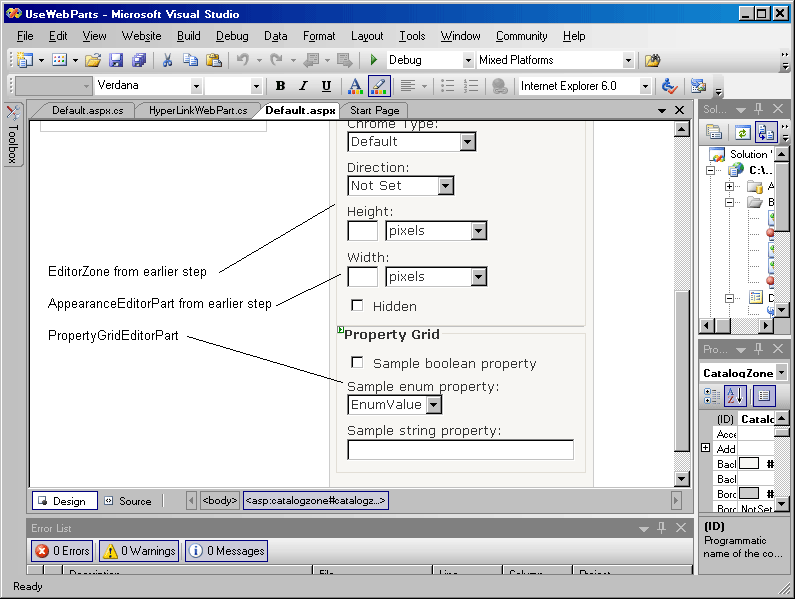 The example delivers a small glimpse into the flexibility and power of Web Parts. However, simply dropping a TextBox onto a WebPartZone isn't very interesting. 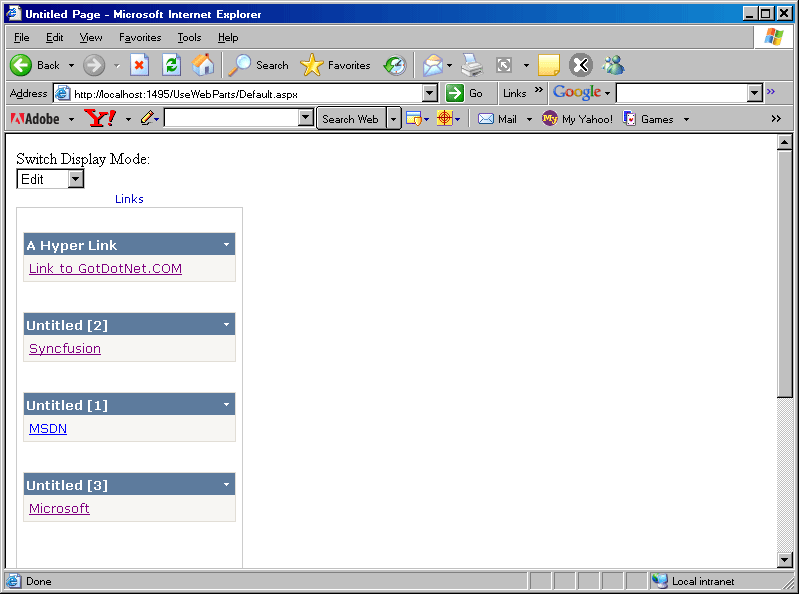 In this example, we'll build a hyperlink Web Part that you may use to augment the Links WebPartZone. Developing a Web Part is actually fairly straightforward and quite similar to developing a custom control (like the ones from Tutorials 4 and 5). Instead of deriving a class from System.Web.UI.Controls.WebControl or System.Web.UI.Controls.CompositeControl, you derive a class from System.Web.UI.WebControls.WebParts.WebPart. From that point, you have the choice of either rendering HTML or composing a Web Part from other controls. 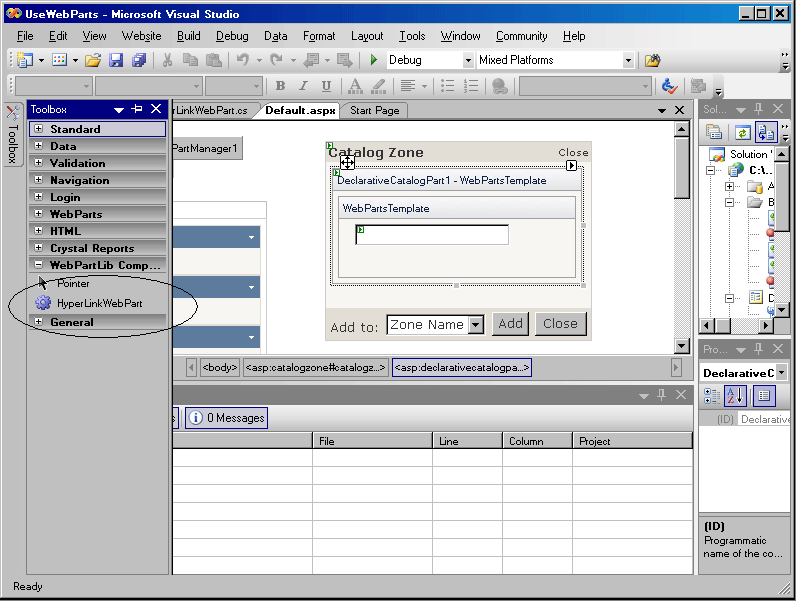 The WebPart includes considerable functionality for integrating with the Web Part architecture. 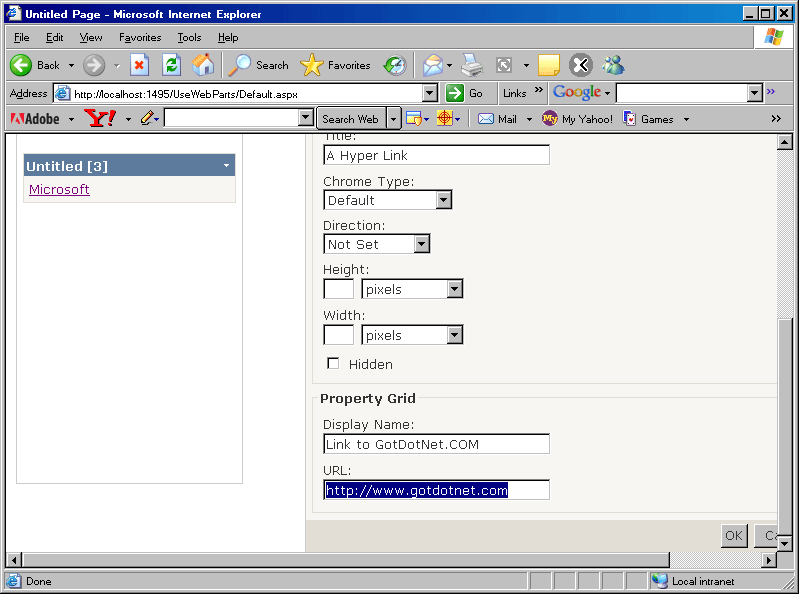 For example, in the next sample, the navigation URL and display name properties of the hyper link Web Part will be exposed as properties that the end user may modify through the PropertyGridEditorPart. 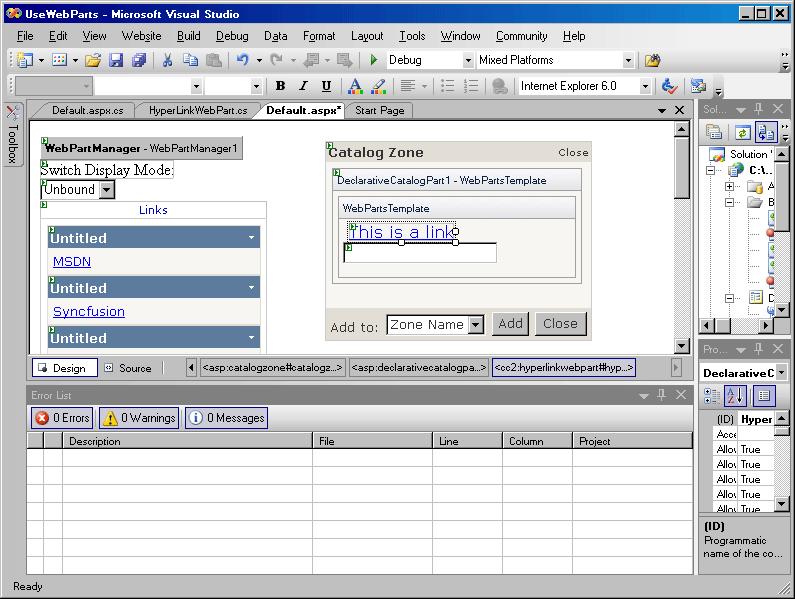 The following example illustrates how to create a hyperlink Web Part that you may add to the Links WebPartZone in the UseWebParts project. While, you could add a regular HyperLink control to the catalog, normal controls don't have the same support for the user to modify the links. For that, the link need to be represented as a Web Part. Make a reference to the System.Web assembly within the new subproject. 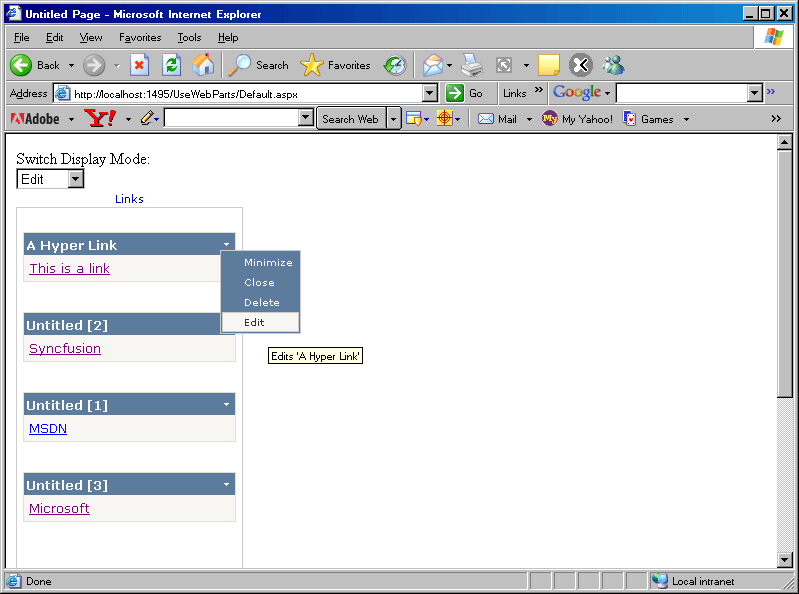 Right mouse click on the WebPartLib node in Solution Explorer and use the Add Reference option from the local menu to add the System.Web assembly. Make sure the project's compiler output is going to a sensible directory (for example, the bin\debug directory for the project). Surf to the Web site. 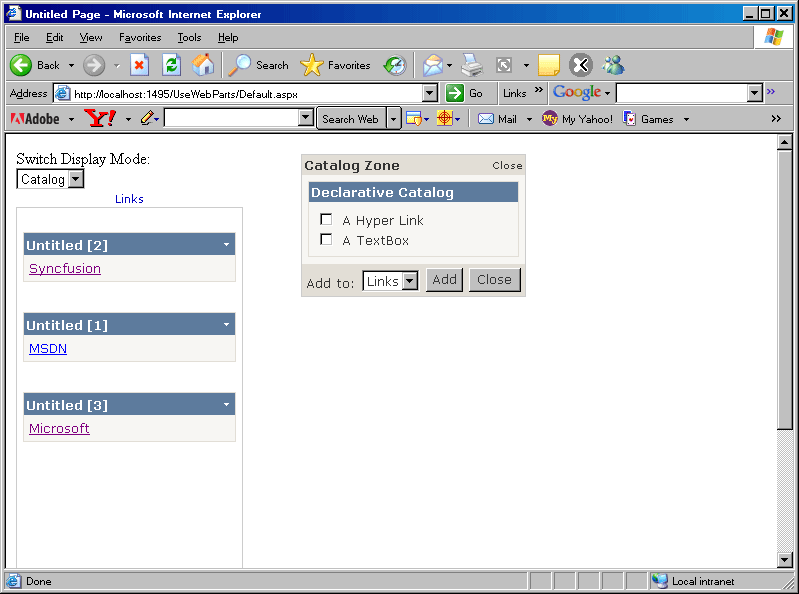 Put the page in Catalog mode by selecting Catalog from the drop- down list box. 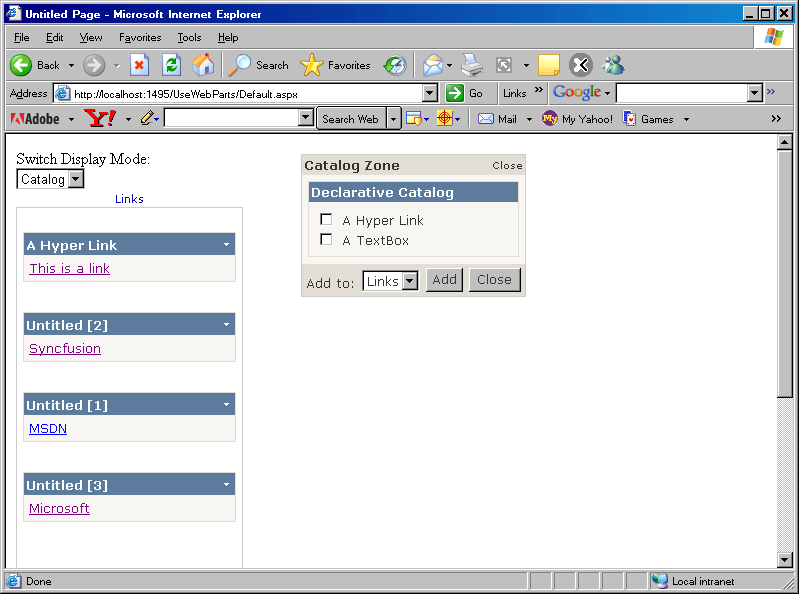 Select "A Hyper Link" from the catalog and add it to the Links Web Part Zone. Put the Web Parts Page into Edit mode by selecting Edit from the drop-down list box. Click on the local menu area on the upper-right corner of the newly added link. Type in a new DisplayName and a new URL. 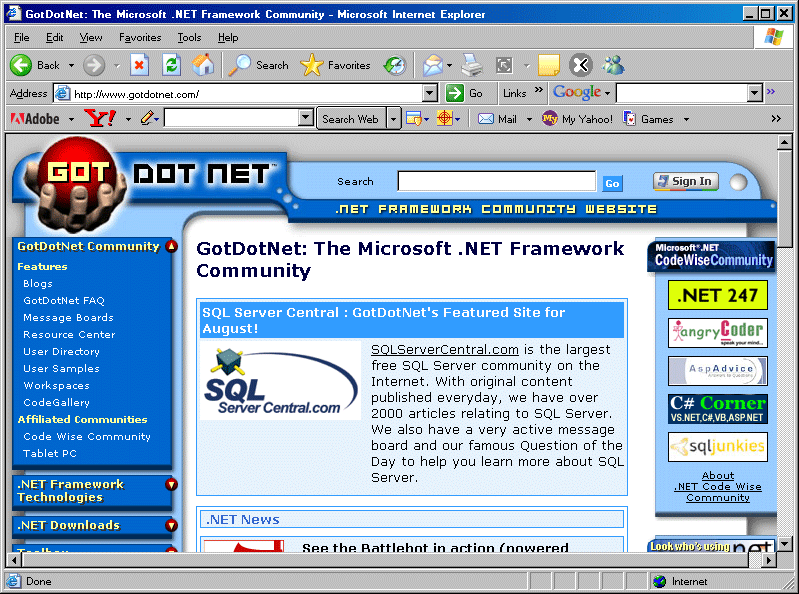 (The example points to www.gotdotnet.com) Select OK. The browser should now show the new properties for the HyperLinkWebPart, and you should be able to surf to the site represented by the link.